A recent poll placed lasagna as one of the most popular pasta dishes that we crave. No surprise there. It shows up as a party favorite to serve a crowd; it is the feature at many potluck suppers and knows no season. It is elegant tasting even reheated. 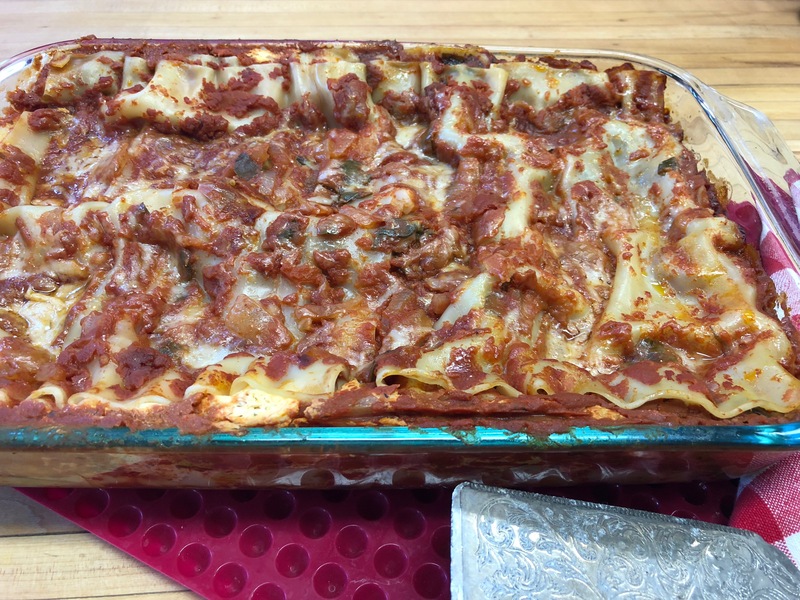 I like the ritual of making the whole thing from scratch, pasta, sauce, filling but we all know how precious time can be, so here is a lasagna that can be put together in twenty minutes if you have the ingredients on hand. That includes no-boil lasagna sheets; that’s the kicker. No boiling and cooling lasagna sheets to mess with. There are many brands out there; some good and some just awful. Go for the good ones, one imported from Italy made from 100% semolina flour. The sheets should be thin, almost see through and wavy so they cook fast, absorb sauce and do not taste gummy. The first bite should be light and luscious and all the more reason why a second helping is necessary. No-boil lasagna sheets (suggest Del Verde brand)Preheat oven to 350F. In a bowl combine the ricotta cheese, eggs, spinach, salt and pepper and 1/2 cup of the grated cheese. Mix well and set aside. Ladle 1 cup of the tomato sauce in the pan and spread thinly. Depending on size of lasagna sheets, place a single layer of the sheets (may need to overlap them but that is ok )on top of the sauce and spread 1 cup of the ricotta cheese mixture evenly over the top. Sprinkle 1/2 cup of the grated cheese over the top Add another layer of lasagna sheet and repeat the process, making 3 layers of ricotta cheese and sauce. Divide and sprinkle the remaining grated cheese on top of the last layer. Top with the last layer of lasagna sheets and spread on the remaining sauce. Cover pan tightly with aluminum foil and place on baking sheet to catch any possible drips. Bake for 40 to 45 minutes. Remove from oven and let stand 5 minutes before cutting to allow the lasagna to firm up. Cut into squares and serve.